One of the delights of traveling overseas is the chance to see a completely different community of birds in the country you are visiting. Sometimes, however, you are so busy doing other things - or you are situated primarily in towns and cities - that you don't get to see a wide variety of local birds. But on our three trips to Cuba we have been located at a resort (Jibicoa Cameleon) that is out in the country, in a park-like setting that attracts a good diversity of bird species. There is not much sight-seeing out there, so there is ample time to relax, soak up the sun, and read a good book at the beach - with a glass of beer to hand - and, of course, to grab a camera and capture images of the many splendid birds that keep you company during your week in the tropics. 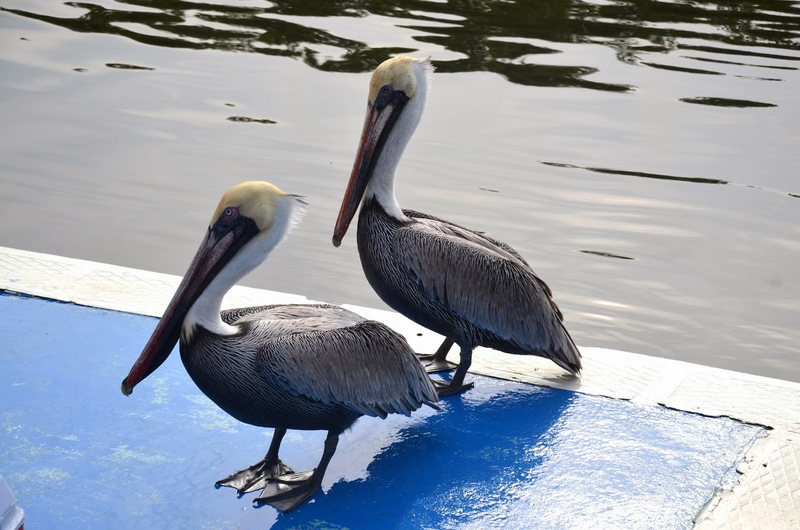 The last time I did a blog post devoted to bird pictures was when my family did its first trip to Florida in March 2012. 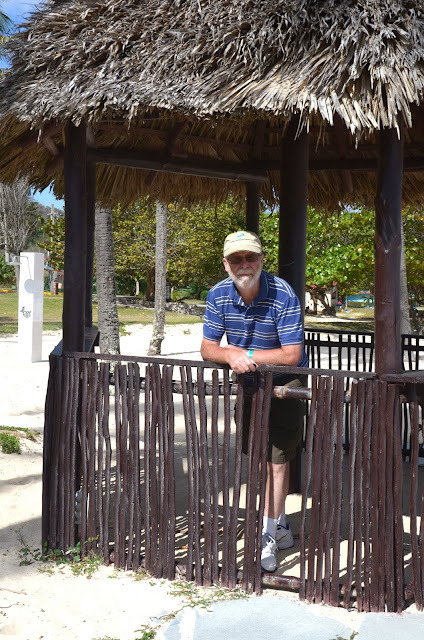 This past March Break (2013), though, we were back in Cuba - our third trip - enjoying again the Jibicoa Cameleon resort on the north coast, about half-way between Havana and Matanzas. This time the task of getting bird pictures was made a lot easier - I had a new zoom lens and a new tripod: a Nikkor 70-300 mm zoom (1:4-5-5.6), and a Manfrotto carbon-fiber tripod (which makes it much lighter than a traditional stand) with a ball-head plate on top that features a joystick control. The joystick allows you to maneouver the camera more easily - in tandem with the ball-joint, the joystick can move the plate that the camera sits on both horizontally and vertically at the same time. The speed and ease of movement is of the essence. Getting good photographs of birds is surely one of the hardest technical challenges in photography. Not always, of course: a large, stationary bird standing in full sunlight is a piece of cake. But there are a set of limiting factors that usually make the task very difficult: the size of the bird, for example, the extent to which it flits about, the amount of light available in a specific location, or at a certain time of the day - especially since I avoid using flash. The length and speed of one's telephoto lens, or zoom lens, is also crucial. And, sometimes, it is just not practical to use a tripod to help stabilize a long lens. The small birds - warblers, for instance - just flit about too much. By the time you've set the tripod in place, the critter has moved on. During our week's holiday at the resort I was out four or five times a day with the camera and tripod. It's good to get photos of the same birds at different times of the day. Softer light (early mornings and late afternoons) is usually best - but you have to get pictures of the birds whenever they show themselves, regardless of location and light conditions. You prepare yourself; you visit the most likely spots for certain species; and you take advantage of the opportunities that come up. It's primarily a case of planning ahead and being ready to work quickly. 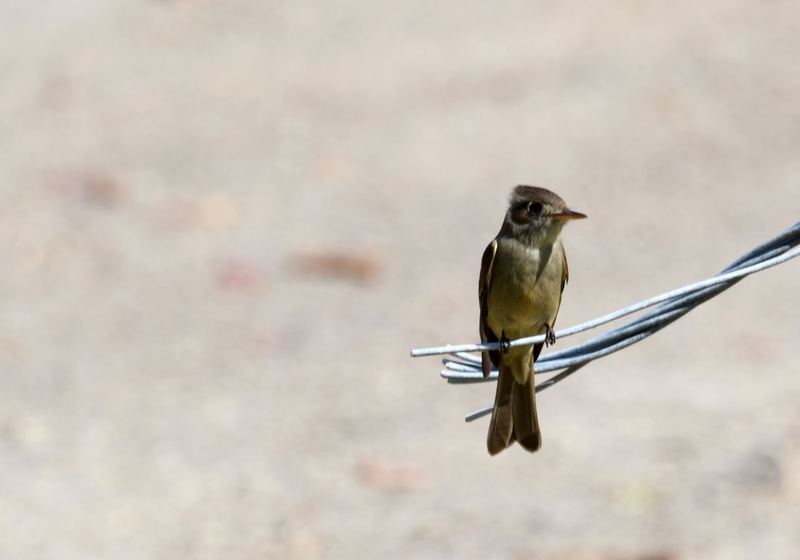 Some of the birds you find in Cuba are very familiar; but other birds are completely different - species you never see in the eastern regions of the U.S.A. and Canada. 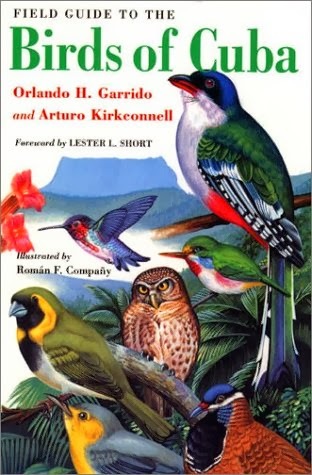 According to my main source of information about bird identification in Cuba - Field Guide to the Birds of Cuba by Orlando H. Garrido and Arturp Kirkconnell - there are 354 species that have been seen in Cuba - including 285 species that occur regularly. 149 species breed on the island. There are 20 orders and 60 families of birds represented. 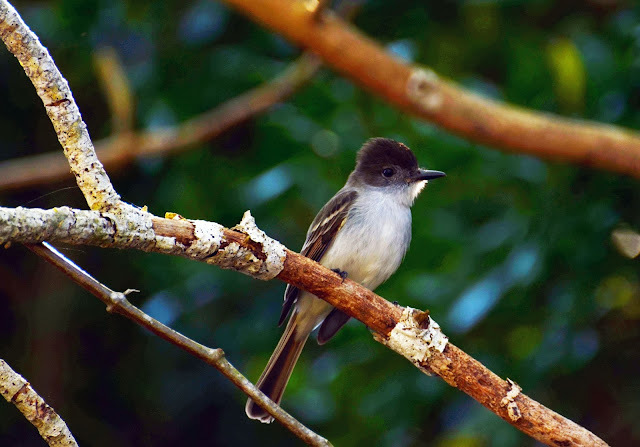 70 percent of the bird species in Cuba are migratory; so the best time to visit would be during the winter months, when you would find a rich combination of winter residents and transient migrants. There are 21 endemic species of birds in Cuba. Cuba is one of the best places for bird-watching in the Caribbean. 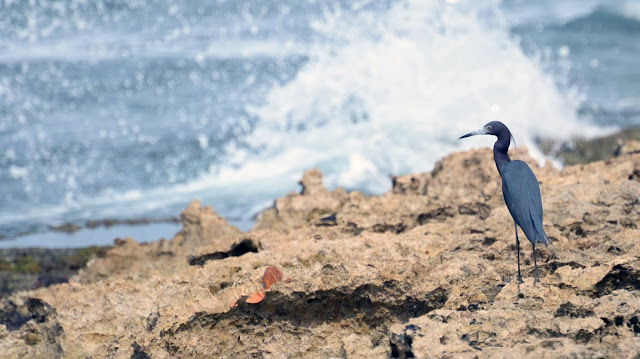 It is home to the largest number of species; and it has several exceptional places to find a rich variety of birds: such as the Zapata peninsula, on the south side of the island. Cuba has a diverse vegetation: there are 15 distinct bird habitats - including rain forest, shrubwood, forest, scrub, wetland and beach. 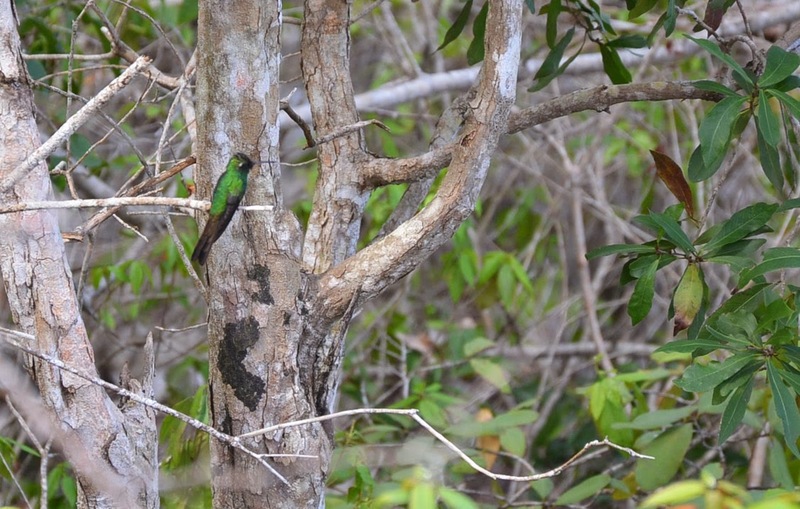 The resort of Jibicoa Chameleon is not located in a particularly hot spot for birding. But of the 36 species I found in Cuba this year (see below for my list), 20 of them were found regularly inside the grounds. Specifically, our resort is found inside lowland serpentine shrubwood (cuabal). Typical birds in this biome are Mourning Dove, West Indian Woodpecker, Northern Mockingbird, Palm Warbler and Yellow-faced Grassquit. Most of these are found at Jibicoa in abundance. Red Legged Thrush (Turdus plumbeus): we saw this bird right outside our room on the first day of our first visit to Cuba. You see it often in trees, but it fills the exact same niche as our American Robin: so most of the time it hops around on the ground, feeding among leaf litter - which it throws up constantly with its bill. It is the same size as a north-American Robin - about 10" long (27 cm). It is easily identified by its prominent orange-red eye-ring and its orange-red legs. This thrush is a common permanent resident in Cuba - found in semi-deciduous woods, pine forests, cactus shrub and gardens. It feeds on insects, lizards and fruits. Turkey Vulture (Carthartes aura): found in abundance everywhere in Cuba. 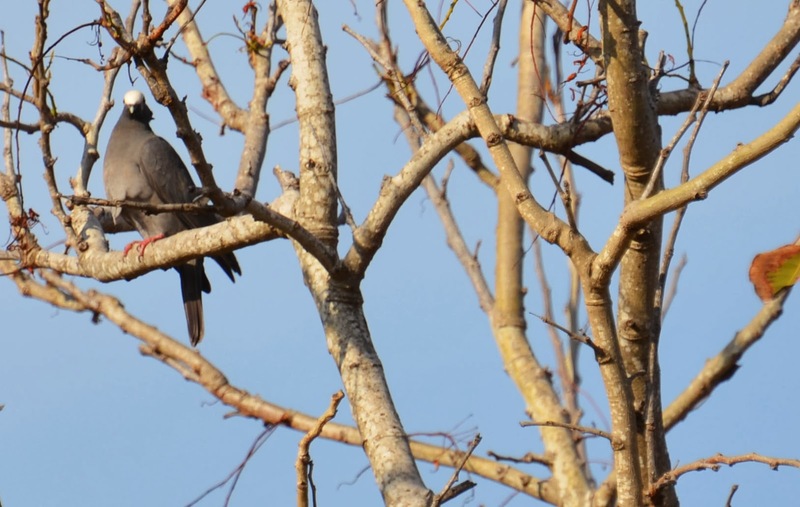 We would often look up and count 20-25 of them soaring along the ridge of the high hills behind our resort. It is called a Turkey Vulture because of its red head, which is denuded of feathers. It is a scavenger and feeds on the carrion of dead animals. It is a very dark chocolate brown colour - but looks black from a distance. It's about 29" long (74 cm). 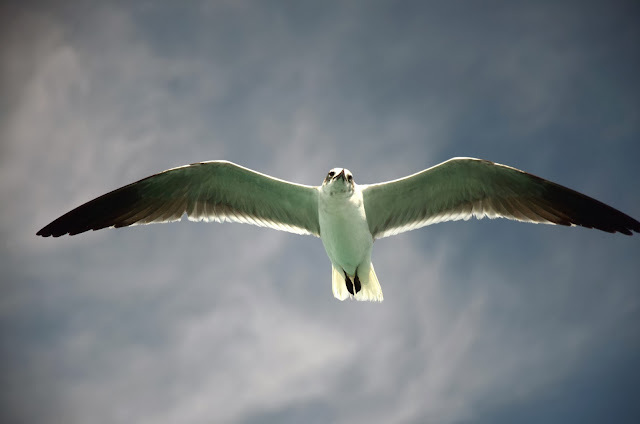 It is easily identified from its flight characteristics: it shows a rocking motion in flight, with its wings slightly above the horizontal in a shallow V shape. Looked at from below, the bulk of its body is dark in colour, but its primary feathers look silvery. You will occasionally find 4 or 5 individuals standing around on the ground, feeding on an animal carcass. 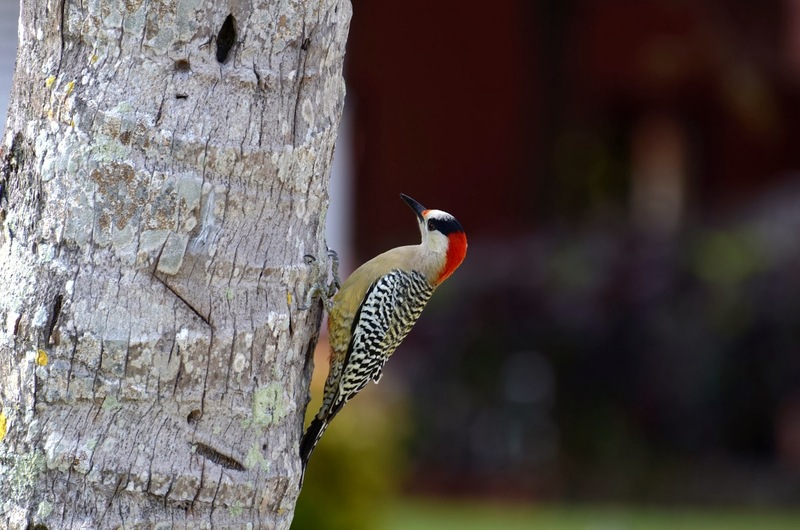 West Indian Woodpecker (Melanerpes superciliaris): this loud woodpecker flies around the grounds of our resort for most of the day; it is found predominantly on the trunks of the very tall Royal Palm trees. It is reminiscent of our Northern Flicker because of the colour-scheme, although it is slightly smaller than the flicker - 11" long (28 cm). It has a red belly. Both males and females sport the red nape, and the male has a distinctive red cap. 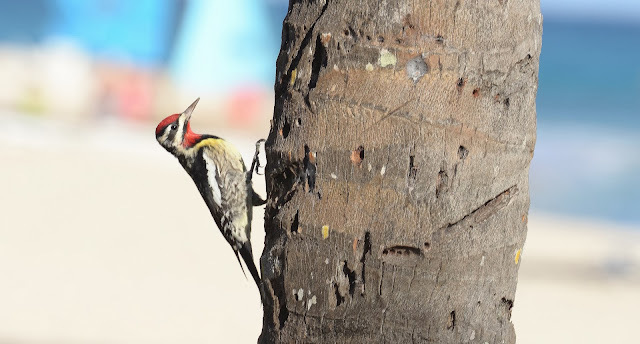 When it is in flight, this woodpecker shows white patches in the outer wing. It is found in forests, palm groves and mangroves. The West Indian Woodpecker has a loud chattering call. It feeds on insects, larvae, small fruit, lizards and frogs. Yellow-Bellied Sapsucker (Sphyrapicus varius): this small woodpecker is also found in north America and is reminiscent of our Downy and Hairy Woodpeckers. It is 8.5" long (22 cm) - which makes it closer in size to the Hairy Woodpecker. The back of this woodpecker is barred with black and white coloured feathers. Its belly is pale yellow and its forehead is red. The male also sports a red throat. It shows a white patch on the inner wing when in flight. 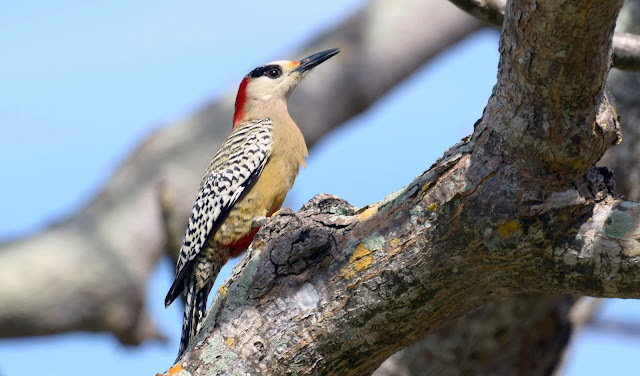 In Cuba, this woodpecker is common in forests, coastal vegetation and scattered trees. It's not very noisy, having a soft mew-like call which reminds me of the Catbird. 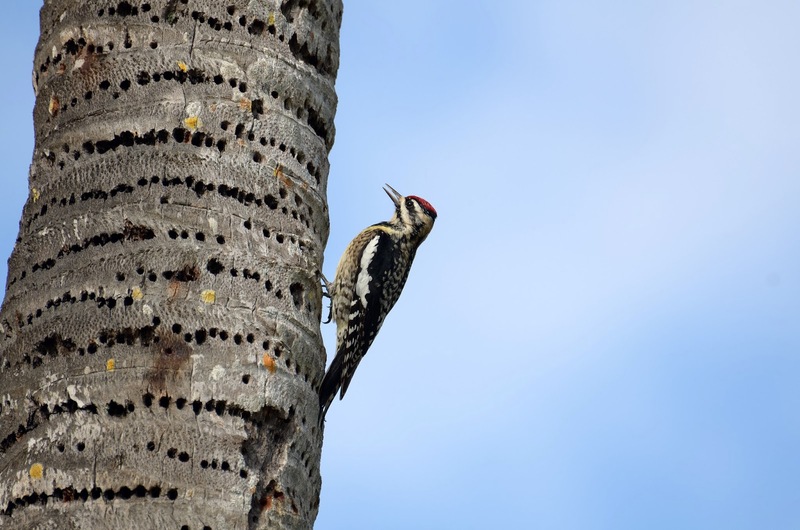 The Sapsucker's name comes from its style of feeding: it pecks horizontal rows of shallow pits in tree bark; and then sips on the exuding sap - it also captures insects that are attracted to the sugary sap. 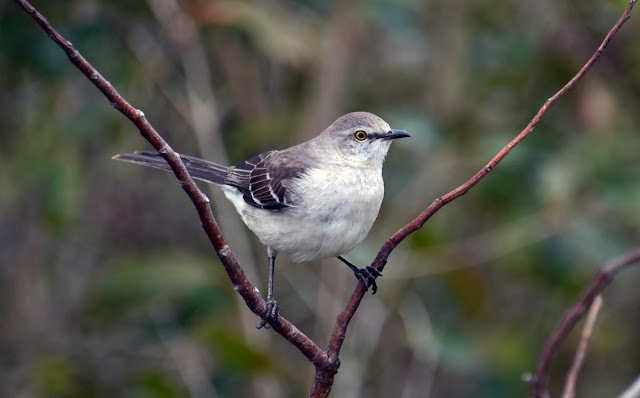 Northern Mockingbird (Mimus polyglottos): this species is one of three species familiar to us in north America as a "mimic thrush" (along with the Grey Catbird and the Brown Thrasher). These are very vocal birds and they learn to copy (mimic) many other species. This bird is about 10" long (25 cm). It is coloured dull-grey above and white underneath. It shows large white wing-patches in flight. This is a gregarious species - often found in villages, gardens, agricultural areas with plenty of shrubs to hide in. The Mockingbird has a loud, varied and melodious song. It forages for food mostly on the ground - favouring insects and small fruits. 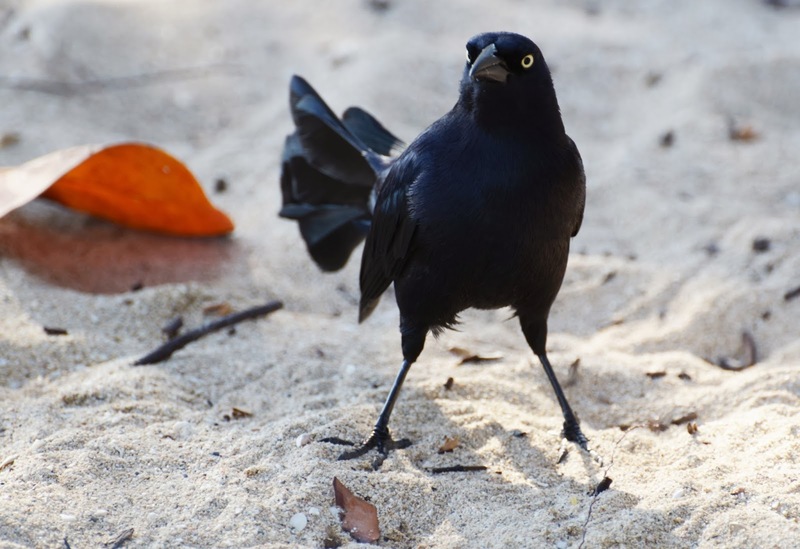 Greater Antillean Grackle (Quiscalus niger): this is about the same size as the north American Common Grackle - 11" long (28 cm), although the tail looks bigger because of its dramatically creased and keeled shape. This bird is loud and aggressive. It is a wonderful example of iridescence: when the light is shining on it from the correct angle, you can see a blue-violet metallic sheen. It also has a bright yellow eye. 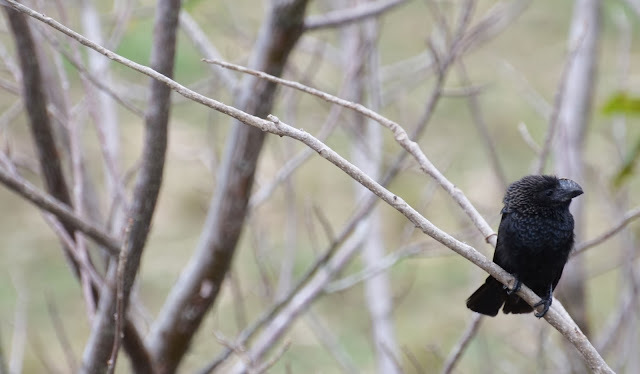 This grackle is found in swamps, coastal vegetation, mangroves, farmland, parks and villages. This species is omniverous. Eastern Kingbird (Tyrannus tyrannus): this is another familiar bird to north American birders. It is about 8.5" long (22 cm). It is coloured slaty-grey above and white underneath. It has a very distinctive, thin, white band across the end of its square-edged tail. It likes open forests, farmland, parks, and towns. 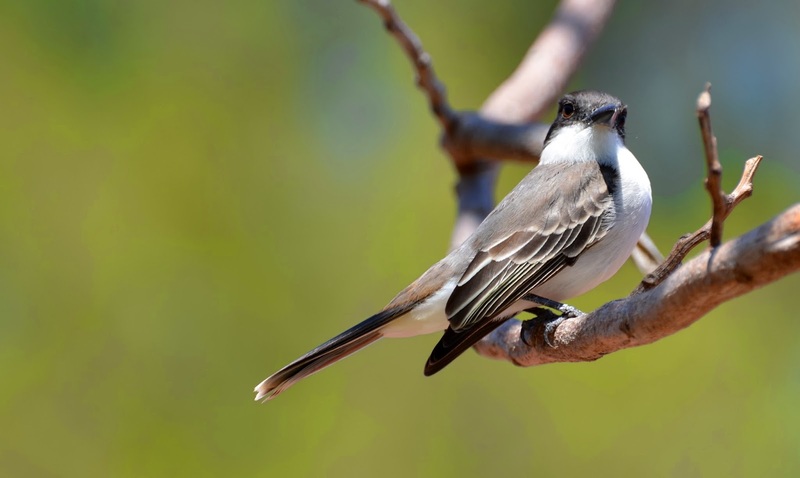 It feeds primarily on insects caught on the wing, but it will also eat small fruits. 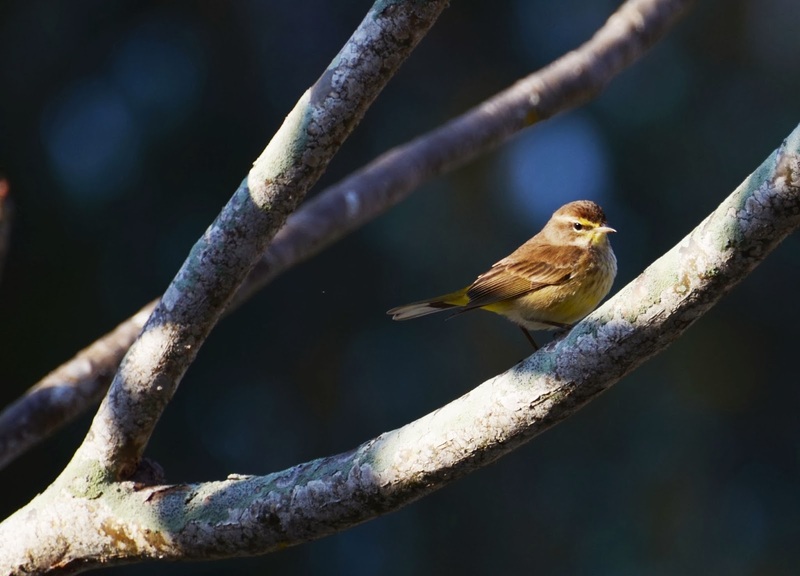 Palm Warbler (Dendroica palmarum): most wood warblers are found perched fairly high in trees; the Palm Warbler, however, likes to hop about on the ground. It is coloured greyish-brown on its back and yellow underneath. Its distinctive features are a reddish-brown crown and a constantly wagging tail. It prefers open forests, savanna, pastures, gardens and coastal vegetation. It feeds on insects. Eastern Wood Pewee (Contopus virens): this is a small bird - it is about 6" long (15 cm). It is an olivaceous brown colour above, with a whitish throat and belly. It also has whitish wing bars. This bird likes open forests and gardens. It is easily identified from its call - a plaintive, slurred pee-a-wee. It feeds mostly on insects caught on the wing. Mourning Dove (Zenaida macroura): this - the first of three dove species I identified in Cuba - is familiar to north American birders. It is slightly bigger than the other two species - about 12" long (30cm). It is greyish-brown above, paler underneath. It has a singular auricular spot (auricular spots are contrasting colour marks often found at the ear area). 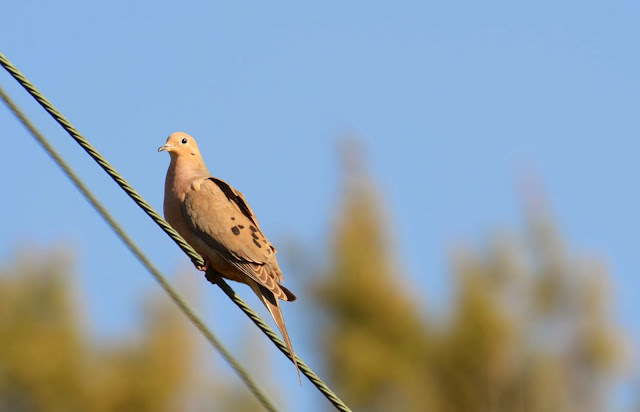 Compared to the other two dove species here, this one has a long, pointed tail. 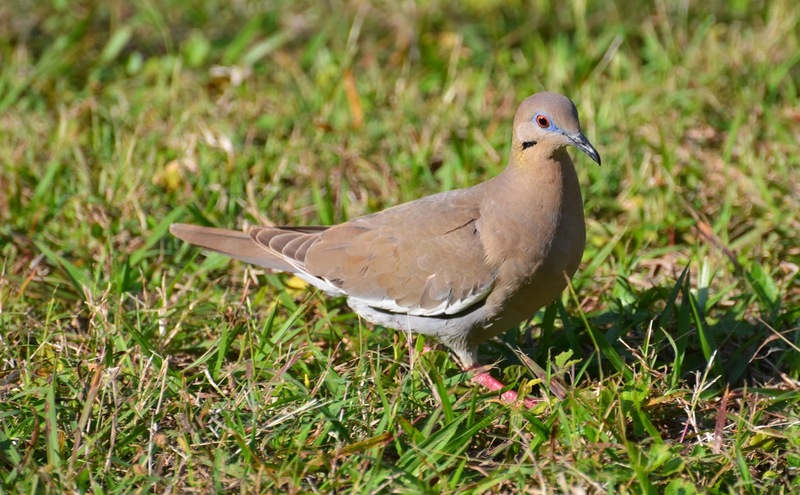 The Mourning Dove is found in a variety of habitats: savannas, pastures, rice fields, coastal vegetation, towns and cities. It has a lengthy and mournful call. And when it is flushed from its perch, its wings make a distinctive sound - called "wing whir". It feeds on seeds, grain, snails, and some small fruits. White-winged Dove (Zenaida asiatica): this is the same size as the Zenaida Dove - 11" long (28 cm). Its colour is similar to the Mourning Dove - without the cinnamon brown hue of the Zenaida Dove. It has a prominent white wing patch - very obvious in flight - which forms a white border along the edge of the wing. It has a black crescent visible under the cheek - larger than the similar mark on the Mourning Dove. It is found usually in semi-deciduous and pine forests, wooded hills and mangrove swamps. It also likes to eat seeds, grain and fruit. White-crowned Pigeon (Columba leucocephala): this pigeon is slightly bigger than our familiar Rock Dove - the correct name for the scavenging pigeon found in most north American towns and cities. It is 14" long (36 cm). Unlike the multi-coloured varieties found amongst Rock Doves, this pigeon is uniformly dark grey, with a touch of iridescent green around the lower neck (more noticeable in the male). The male has a distinctive white-coloured crown; the female's crown is grey. It is found in semi-deciduous forests and mangroves. It eats fruit and seeds. Laughing Gull (Larus atricilla): on our catamaran trip from Varadero to Cayo Blanco, we were followed much of the time by a flock of Laughing Gulls. It was a bit tricky trying to photograph them from a moving boat, with a long zoom lens, but I was able to get a few good shots. This gull is 3" shorter than our familiar Ring-Billed Gull - it's 16" long (41 cm). It's a white gull, but most of its back and wing tops (the mantle) is dark grey; and it has black wing tips. The head is black, and its legs and bill are dark red. It is found mostly over the waters around cays, bays and beaches. Its name, of course, comes from its laughing-styled cry. 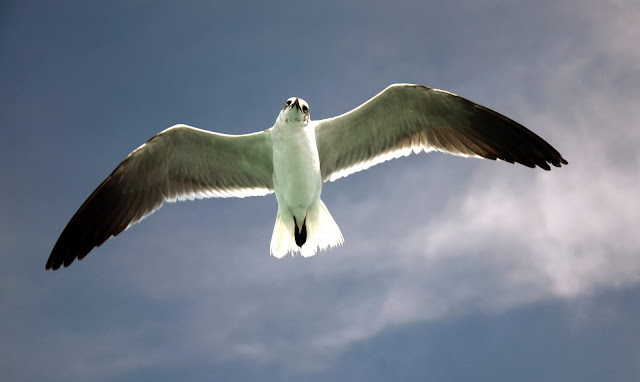 Like most gulls, it is an opportunistic scavenger - it will eat garbage, snails, insects and seabird eggs. Little Blue Heron (Egretta caerulea): herons and egrets are amongst my favourite birds. They stick around for a long time - as long as you don't disturb them - and they have the size and slow movements that make them relatively easy to photograph. I found the adult of this species several times along the rocky beach - but in a quiet location where it was undisturbed by tourists. It is a rather small heron: compare its 24" length (61 cm) to North America's familiar Great Blue Heron, which is twice as big - 48" long (122 cm). 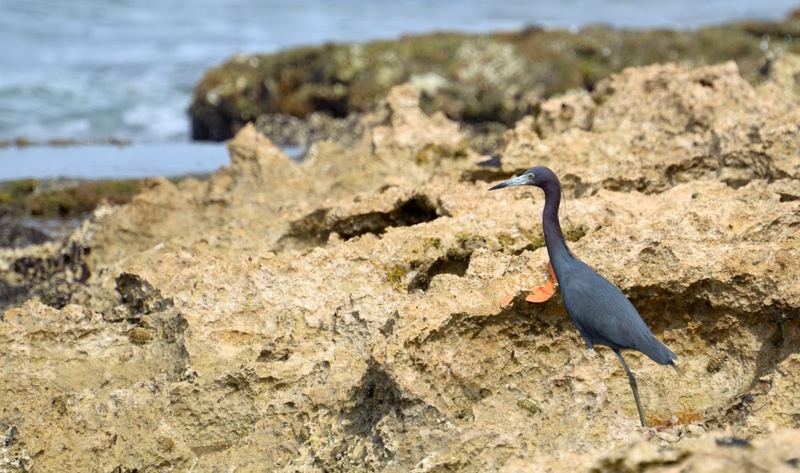 Most of The Little Blue Heron's body is slate blue, but the head and neck are a violet-brown colour. Its bill is greyish blue, with a black tip. The legs are green. It is usually seen standing still. And it often flies with its neck extended. It is found in freshwater and saltwater swamps, lagoons, ponds, beaches and quiet creeks. It feeds mostly on fish, amphibians and aquatic invertebrates. 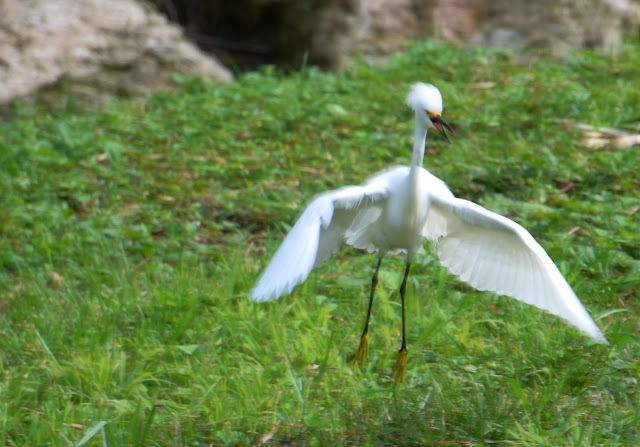 In addition to the adults I found along the beach, I also came across an all-white heron several times beside the quiet creek that flows along the eastern boundary of the resort. It took me a while to identify the bird, because of its uncharacteristic legs and bill. Eventually, I discovered that it was an immature Little Blue Heron. Unlike the dark legs of the adult, the immature has dull olive legs. And its bill is a pale-blue colour. The colour of its bill and legs distinguishes this immature heron from the other all-white herons and egrets in Cuba. 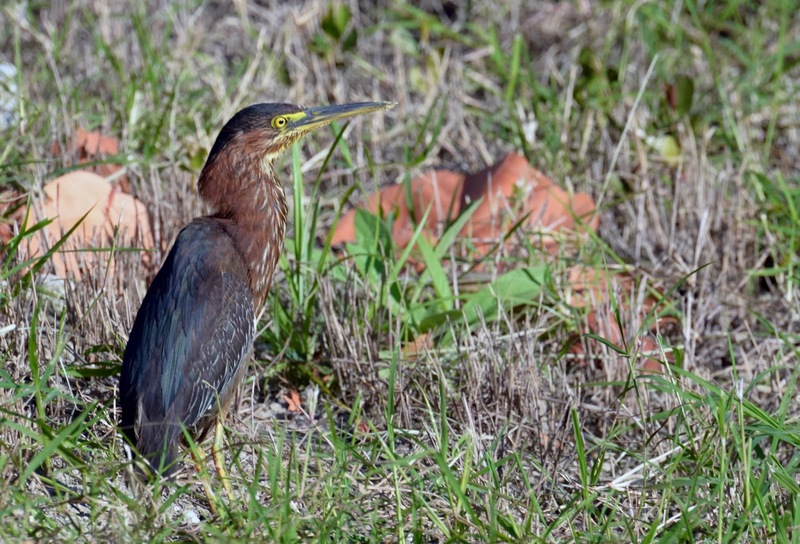 Green Heron (Butorides virescens): this was an exciting find. I saw a small heron-like bird flying over the parking area at the front of the resort's main building. I followed it over towards the creek and eventually found it standing in the grass at the edge of the slow-moving water. 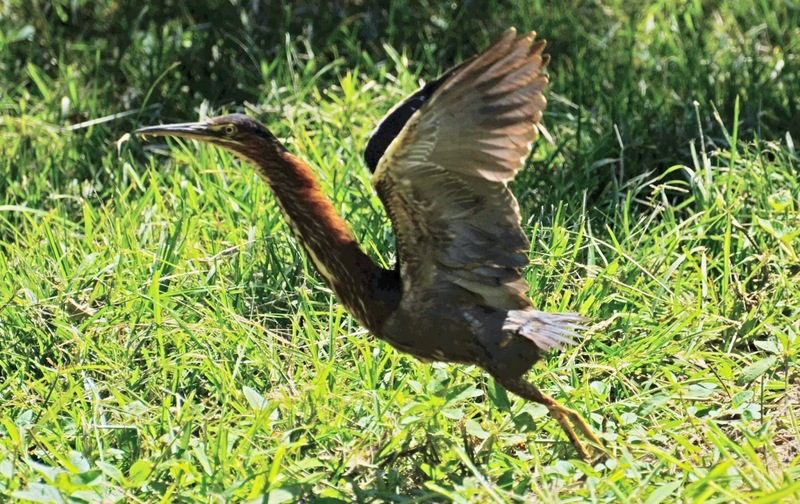 It was a Green Heron. Strange name, really, since it has a blue-grey back, and a chestnut-brown head and neck. The greenish hue shows as an iridescence sometimes on its back. And its short legs are yellow, with a slight greenish tinge. 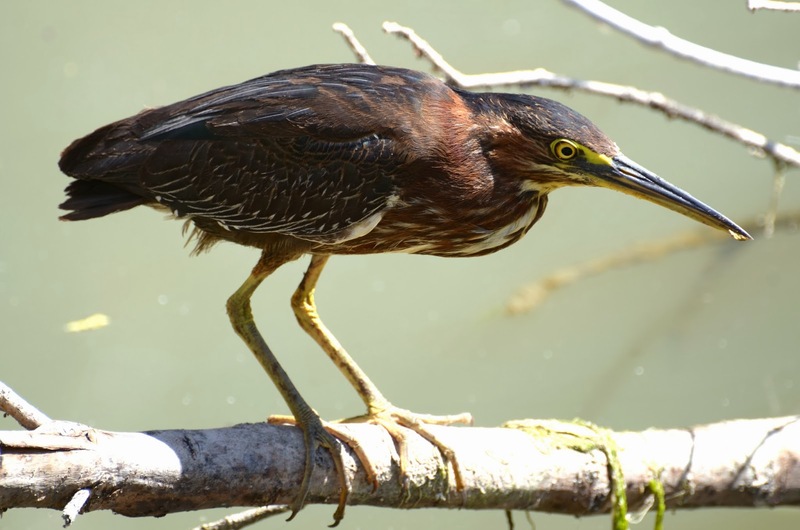 It is a small heron - 18" long (46 cm) - even smaller (by 6") than the Little Blue Heron. When it stands with its neck outstretched, it looks completely different to its squat, crouched-over appearance. It prefers fresh water streams, but can also be found beside brackish and salty water. It feeds on insects, fish and terrestial vertebrates. 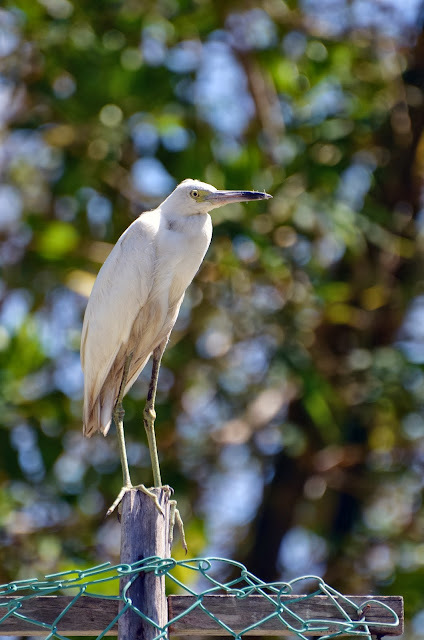 Cattle Egret (Bubulcus ibis): this egret is small - but at 22" (56 cm) it's still larger than the Green Heron. 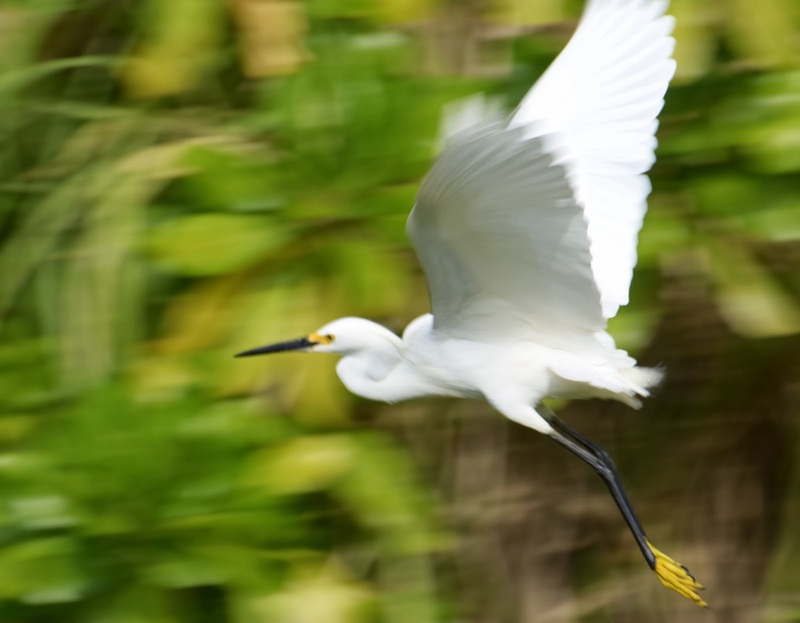 This all-white egret can be differentiated from other all-white herons and egrets by its orangey-yellow bill and its yellowy-green legs. When it's breeding this egret has buff plumes on top of its head, at the base of its foreneck, and on its back. It is found primarily in marshes, swamps, and farms - where the soil has been turned over and cattle are grazing. It feeds on insects, mollusks, and other small vertebrates. Snowy Egret (Egretta thula): this egret is a bit bigger than the Cattle Egret. It is 24" long (61 cm). It is entirely white; and it is distinguished by its black bill and legs. And when it flies, its trailing bright yellow toes are unmistakable. It is the most active of all herons when searching for food - constantly stirring up mud and sediment with its feet. It is found in fresh, brackish, and saltwater areas; and it feeds on fish and invertebrates. A very attractive bird. Magnificent Frigatebird (Fregata magnificens): this coastal bird, which feeds on fish, jellyfish, and crustaceans, is usually only seen from a great distance. I saw it a couple of times flying high above the resort, parallel to the beach. It is fairly easily identified, because of its very long, narrow wings, its short legs, and its long, hooked bill. The tail is very long and deeply-forked. They have a very distinctive red throat pouch, which is not that visible, unless it is inflated. But in two of the photos I took, the red throat patch is quite evident. 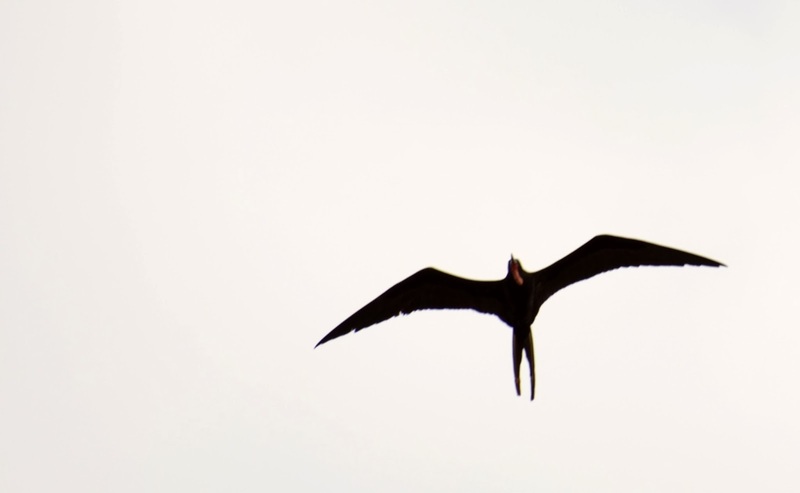 The Magnificent Frigatebird flies high, with a motionless, soaring flight. Its distinctive shape gives it an unmistakable silhouette. 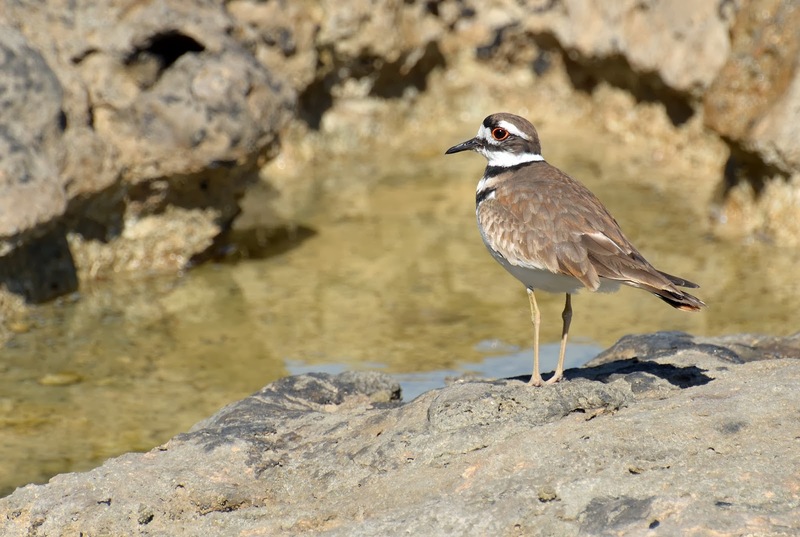 Killdeer (Charadrius vociferus): this medium-sized shorebird - 10" long (25 cm) - is very common in north America. It is a mottled brown above and white underneath. The two, bold, black, breast bands are very distinctive. It has a black bill and dusky yellow legs. I found my Killdeer on a rocky beach, near a Little Blue Heron. In flight it shows a tawny-golden rump. 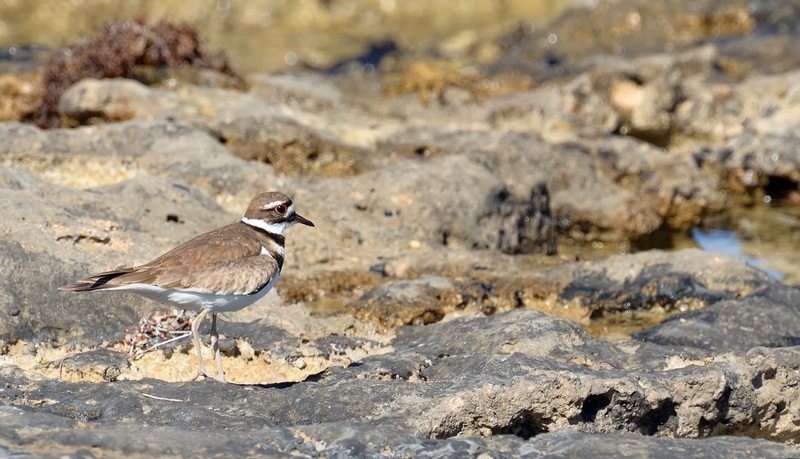 In Cuba, the Killdeer is found in savannas and on seashores. Smooth-Billed Ani (Crotophaga ani): An odd looking bird. It is completely black with some iridescence. The short bill is deep and compressed sideways. The Ani has a very long tail, which moves around so loosely that it almost appears to have been attached to the rear of the body. It likes grassy and bushy areas, and can often be found in shrubs and hedges along the road - which is where I found it this year. The Ani feeds on insects, lizards fruit and seeds. 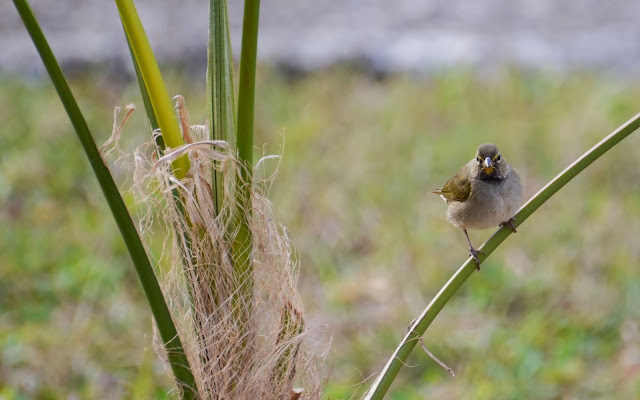 Yellow-Faced Grassquit (Tiaris olivacea): this small perching bird is only 4.5" long (11 cm). The male is coloured olive green above and greyish underneath. It has an orange eyebrow, orange throat patch, and a black patch on its breast which gets bigger as it ages. The female lacks the breast patch. It is found in shrubs, thickets and farmland. Its diet consists primarily of seeds, small fruit, and tender shoots. Prairie Warbler (Dendroica discolor): this wood warbler is olive-coloured on its back and yellow underneath. It has dark black streaks on its face and sides, and some chestnut streaks on its back. One of its distinctive behaviours is tail-wagging. It is found in open forests, thickets, mangroves, scrub and gardens. It eats insects, spiders and small fruits. 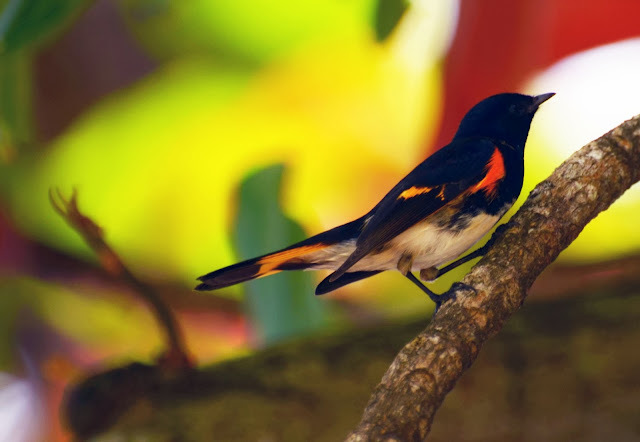 American Redstart (Setophaga ruticilla): this is a dimorphic wood warbler - the male and female are very different. The individual I managed to photograph was a male. It is generally black with bright orange patches on its side and wing, and on the base of its tail. Its belly is yellow. 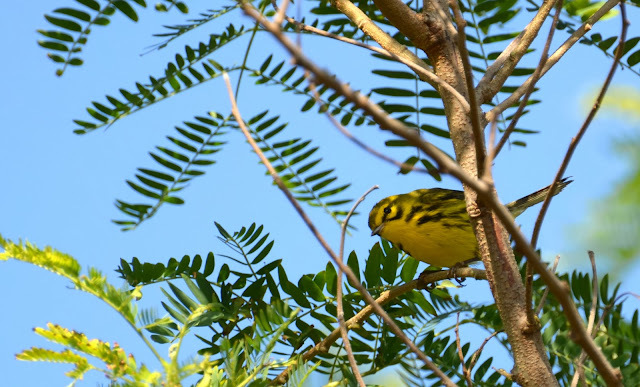 It is a very active bird - like most warblers - and it engages in characteristic short drops through the branches of trees, chasing flying insects. It is found in forests, swamps, gardens and mangrove-covered cays. It is an insectivore - feeding mostly on insects caught on the wing, or found on tree leaves. 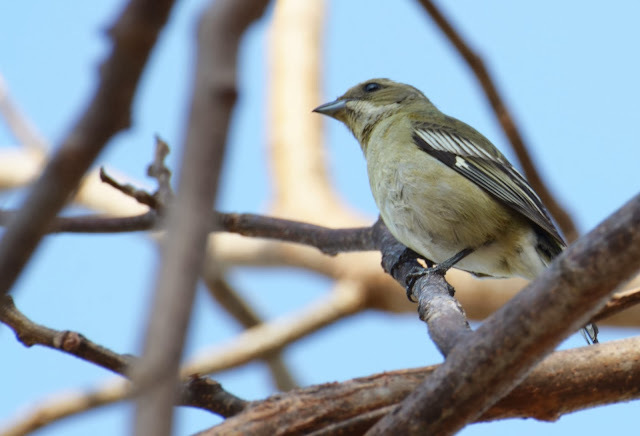 Stripe-Headed Tanager (Spindalis zena): this was a new species for me - I briefly saw and photographed a female of the species. It is a bit smaller than the Tanagers we are familiar with in north America - 6" long (15 cm). The female is olive-grey above, and pale-greyish underneath. It has indistinct markings on the head, unlike the distinct black-and-white head markings of the male. 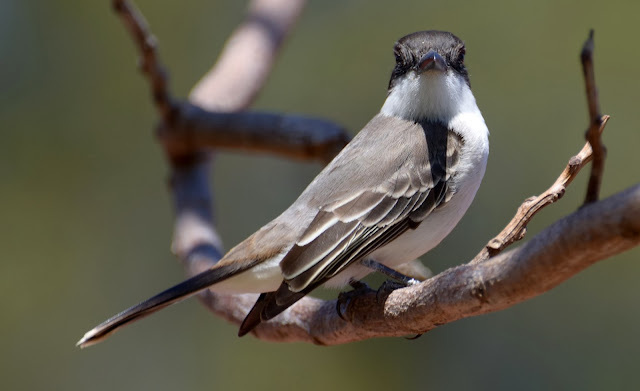 It has a short and heavy bill, designed to eat seeds and fruits. It also feeds on insects. Common Black-Hawk (Buteogallus anthracinus): this was a surprising find in a mangrove swamp on Cayo Blanco. Near the beach I heard a continuous, high-pitched, whistle-like shriek. I followed a path back through the vegetation, and found it perched about twenty feet up, at the top of a tree. It is a very large hawk - 21" long (53 cm). This hawk is - despite the name - chocolate brown in colour, with broad wings, and a short tail coloured with black and white horizontal bands. Its legs, and the base of its bill, have an orangey-yellow hue. It is found in mangroves and coastal swamps. 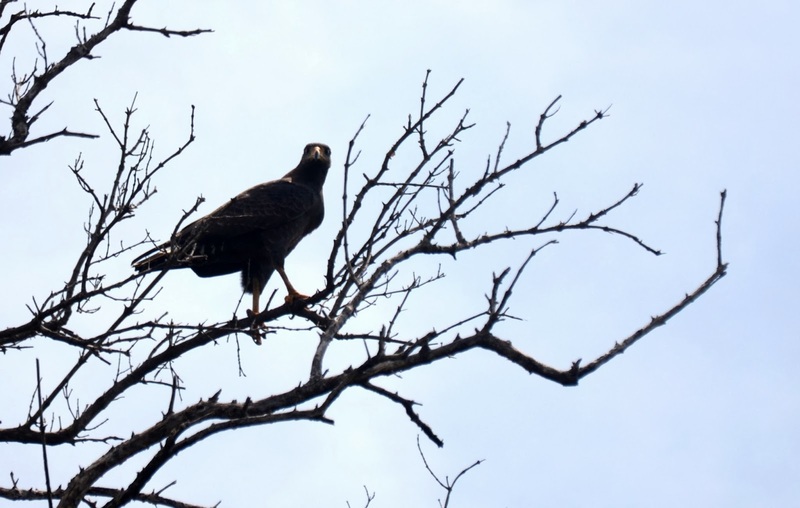 This hawk feeds mostly on crabs and birds. American Kestrel (Falco sparverius): we saw this small falcon on two different trips, in roughly the same location - up on telephone wires and on an electricity pole beside the road leading away from our resort to the main highway. It is about the size of a jay - 10" long (25 cm). The Cuban race of Kestrels comes in two colour morphs: one has a white chest and belly; the other - which is the one we saw - has a rufous chest and belly. The male has bluish-grey wings; the female's wings are also rufous. Both sexes have two vertical black facial stripes on their heads. 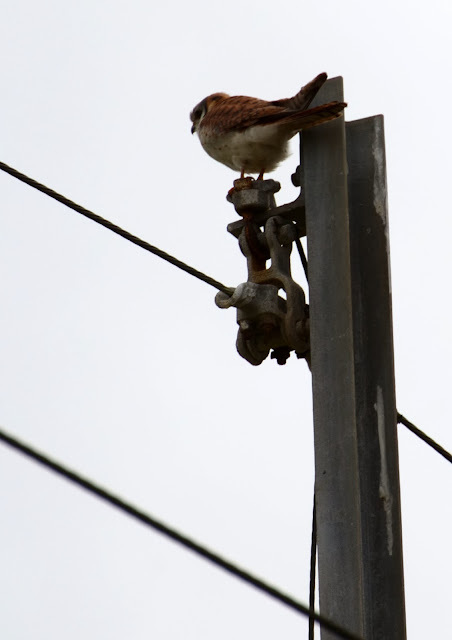 The Kestrel often perches on high bare branches, and the top of telephone poles. When it has spotted prey, it often hovers for quite a while above its target, beating its wings rapidly as it waits for the precise moment to strike. It favours both open country and cultivated lands near built-up areas. It feeds on lizards, mice, small birds, and large insects. Cuban Emerald Hummingbird (Chlorostilbon ricordii): this small hummingbird is 4" long (10 cm). We saw it during a hike along the ridge of a steep hill behind our resort. It was about four feet off the ground, in good camouflage - a small, vibrantly-green shrub. I was lucky to get a fairly good picture of this species - they don't stick around for long, and they beat their wings at a very rapid pace. If they perch for a moment nearby, you are fortunate indeed. This bird is almost entirely emerald green, but is has a blue iridescence that is occasionally seen on its chest, if the light is shining on it at the correct angle. It has a relatively long, black tail that is forked. The Cuban Emerald is found in forests, coastal vegetation, and gardens. It feeds on nectar, spiders and insects. 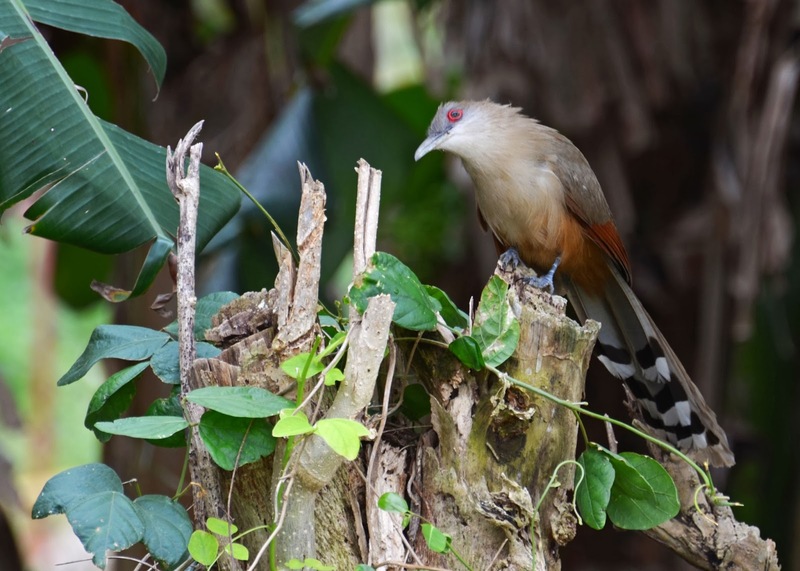 Great Lizard-Cuckoo (Saurothera merlini): we have seen this incredibly impressive bird on two of our Cuban trips - both times in small trees beside the road. It is a large perching bird - 20" long (51 cm). It is coloured olive-brown above and grey and buff underneath. Its tail is very long and has prominent black and white horizontal stripes. 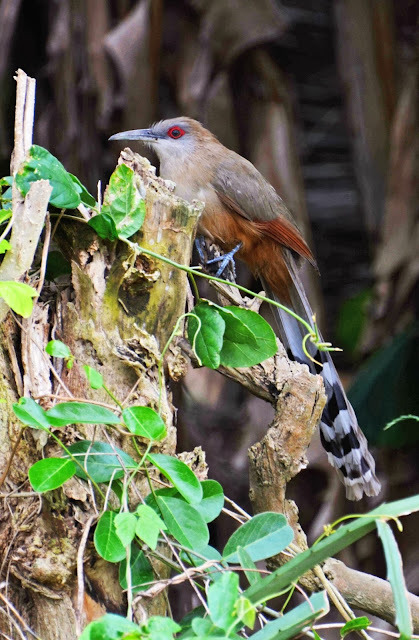 This Lizard-Cuckoo also has a very long, blue-grey bill that is slightly curved downwards. It has prominent orange-red eyes. It is not a particularly good flier, so it is often seen gliding from treetops and foraging for food on the ground - sometimes even seen running along the ground, instead of taking to wing. It is found most in wooded areas, forests and shrubs. It feeds on lizards, frogs, bird eggs, snakes and small vertebrates. Brown Pelican (Pelecanus occidentalis): these pelicans are found all over Cuba - we saw them, for example, in Varadero, Cayo Blanco and Havana. It's a huge bird - 50" long (127 cm). It is primarily silvery, greyish-brown, with a head, and part of the neck that is yellowy-white. It is impressive looking in flight; it alternates between flapping and gliding. It is found most often in beaches, bays and estuaries. It feeds primarily on large fish found in schools - grabbing them after in plunges head-first into the water. Most of these photographs were taken with a Nikon D7000 camera using a Nikkor 70-300 mm telephoto zoom lens. Resource: Birds of Cuba by Orlando H. Garrido and Arturo Kirkconnell, Comstock Publishing Associates, 2000.